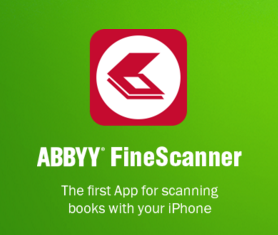 February 16, 2016 – FineSсanner – the top mobile scanner for iPhone from ABBYY the world-leading OCR software company and developer of document-capture and language-based technologies. 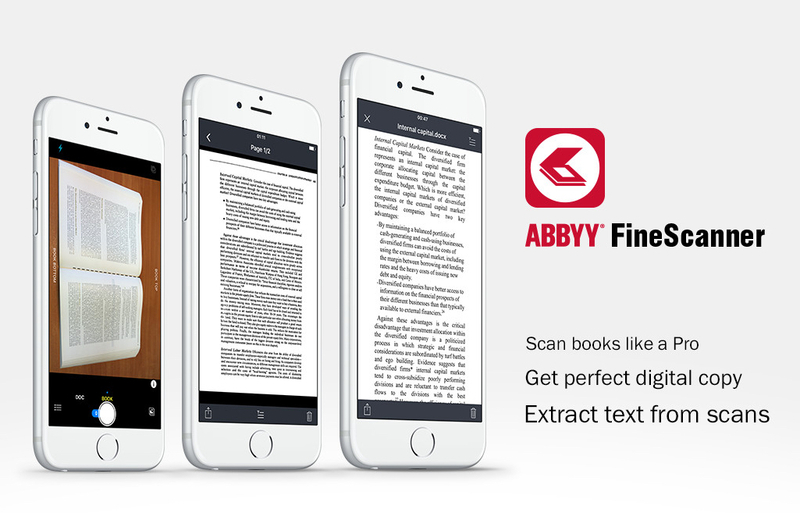 There’s some great news from FineScanner, the amazing mobile document scanner, now includes ABBYY’s breakthrough BookScan technology. 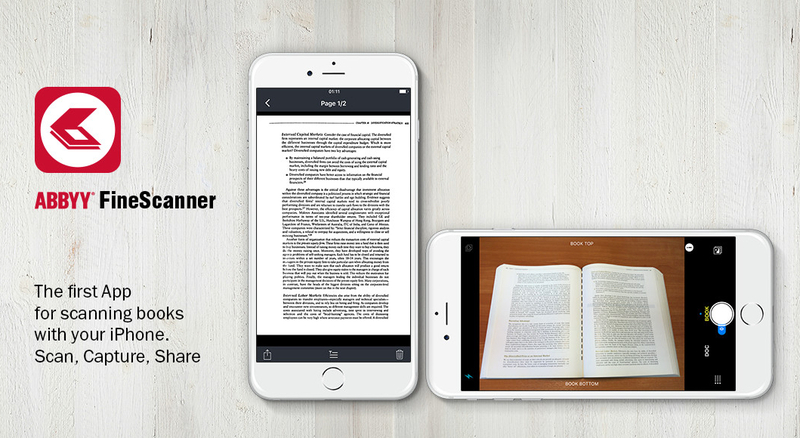 Finescanner is the first iOS App in the world for scanning books with your iPhone and iPad. ABBBY’s proprietary BookScan technology automatically finds the edges of a page and captures an image without having to press a button. All you have to do is place your smartphone on a document and BookScan begins scanning automatically. “We developed BookScan technology over two years of intensive R&D. It simply has no peers in the mobile capture market and it has no analogies. You don’t need to have a scanner for books, bills, contracts or other paperwork – just use BookScan. It recognizes book pages on snapshots and splits them into two separate images, each containing only one page. It automatically corrects curved lines on a page, removes geometrical distortions, and repairs lighting defects. Book scanning has never been easy. ABBYY’s technologies are used by more than 40 million people in 200 countries around the world,” said Artem Kumpel, VP of Mobile Products at ABBYY. ABBYY FineScanner is the only App in the world that recognizes and converts any document of printed material into 193 languages, including Chinese, Arabic, Indonesian, Yiddish, Guarani, Latin, Mayan, Franco-Provençal, Japanese, Afrikaans, Maltese, Hindi, Farsi, Catalan, Dutch, Norwegian, Urdu, Brazilian Portuguese, Korean, Danish, Greek, Swahili, Swedish, Macedonian, Esperanto, and С/С++, Java. This latest update offers users increased functionally over prior versions of the FineScanner Mobile App. You can save your document in 12 popular formats: Word, Excel, Powerpoint, and PDF, among others. Your documents can be sent via e-mail, or saved into the iPhone or iCloud servers. The new FineSсanner App fully implements the capabilities of iOS 9 with on-device search functions and as auto-capture technology. And for iPhone 6S/6S Plus users, tactile response lets you see the results of your scanned documents in an instant. Spotlight Search allows you to find any scanned text, and keeps them on your mobile device, always ready to access. ABBYY FineScanner is the most technologically capable mobile scanner from the world from leader of scanning documents and linguistics, ABBYY. ABBYY FineScanner turns your mobile device into a powerful all-purpose mobile scanner & document manager that allows you to quickly capture images, creating electronic documents in PDF and JPG, and apply OCR to recognize texts for further editing and sharing. Ranked #1 Business application in 98 countries. Winner of SUPERSTAR Award in the ‘Document Capture’ category in the Mobile Star Awards. FineScanner works/recognize text (OCR) on scans in 193 languages and choose from among 12 output formats. More than 40 million people from more than 150 countries currently use ABBYY products and services. ABBYY OCR applications are shipped with equipment from the world’s top manufacturers such as Epson, Fujitsu, Fuji Xerox, Microtek, Panasonic, PFU, Plustek, Ricoh, Toshiba, and Xerox. To activate the BookScan feature, you need to purchase a one-month ($5) or one-year ($20) premium account. You can also sign up for a free 7-day trial period to try out all of the premium account features. You can download the application for free from the App Store. More info www.finescanner.com, Product Hunt.